UPDATE: ComponentForge and Safabyte websites are now redirected to XtraComponent. NetXtremeProxy Rebex Uses code from Rebex.Net.ProxySocket which is part of most Rebex components. E.g. Rebex POP3 or Rebex FTP. NetXtremeWhois Rebex Uses code from Rebex.Net.ProxySocket which is part of most Rebex components. E.g. Rebex POP3 or Rebex FTP. Security: Added support for signatures based on SHA-2 (SHA-256, SHA-384 and SHA-512). FTP - IEnumerable support added to collections. SEC - Added support for signatures based on SHA-2. SEC - Faster AES implementation is used. FTP - Added automated UTF-8 detection. EVIDENCE: Same features added only two weeks after Rebex. NOTE: They don't even seem not to know the difference between IEnumerable and IEnumerable<T>. FTP - Fixed a bug in MODE B transfer mode that might cause an improper block length to be received in rare circumstances. FTP - Disposing FtpClient object from another thread while an operation is in progress no longer causes NullReferenceException and other similar errors to occur in the operation thread. SEC - Fixed a bug in DiffeHellman class that made it impossible to import key with all parameters filled. 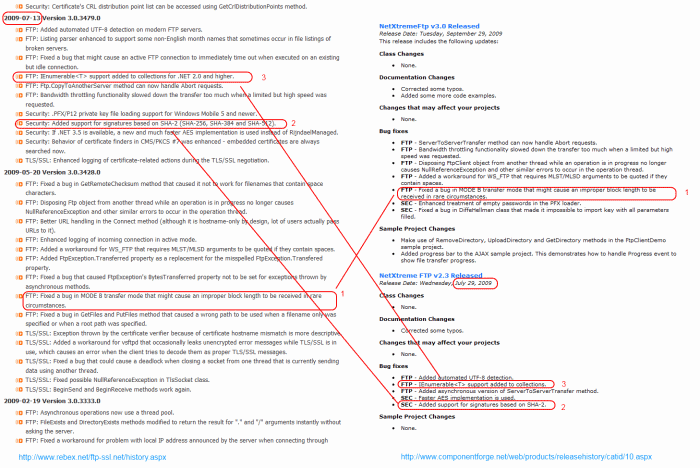 EVIDENCE: Identical bugfixes. How is that possible if the codebase is supposed to be different? NOTE: Some bugfixes from our previous builds seem to be listed under a wrong release. 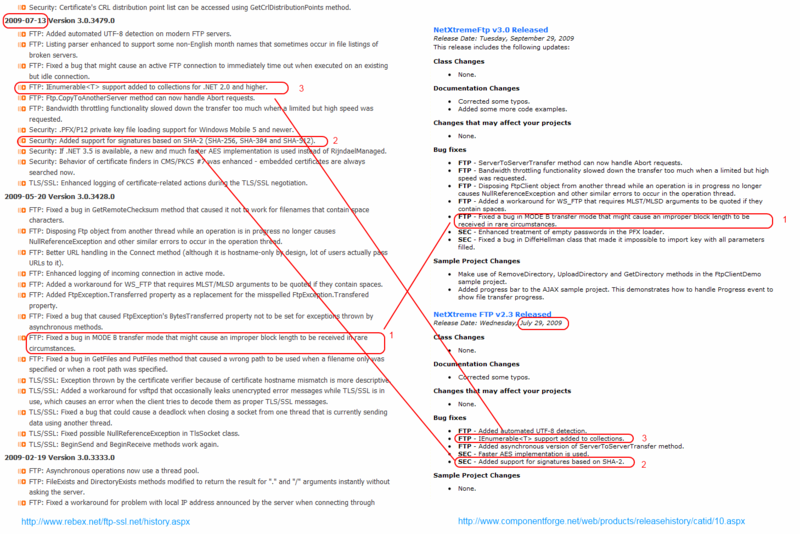 EVIDENCE: Notice the same typo in DiffeHellmanManaged (should be DiffieHellmanManaged). UPDATE 2009-11-27: The componentforge site was changed and release notes are slightly reworded. The google cache still contains the original version with exactly same wording as at rebex.net site. Both communication logs were produced by the code from the previous paragraph. The similarity is striking and doesn't need any further comment. 2009-26-11 19:24:03.408 Opening log file. 2009-26-11 19:24:03.438 INFO Ftp(1) Info: Connecting to ftp.rebex.net:21 using Ftp 3.0.3588.0. 2009-26-11 19:24:03.438 INFO Ftp(1) Info: Using proxy none. 2009-26-11 19:24:03.498 DEBUG Ftp(1) Info: Connection succeeded. 2009-26-11 19:24:03.528 INFO Ftp(1) Response: 234 AUTH command ok; starting SSL connection. 2009-26-11 19:24:03.528 DEBUG Ftp(1) Info: Upgrading control connection to TLS/SSL. 2009-26-11 19:24:03.568 DEBUG Ftp(1) TLS: HandshakeMessage:ClientHello was sent. 2009-26-11 19:24:03.608 DEBUG Ftp(1) TLS: HandshakeMessage:ServerHello was received. 2009-26-11 19:24:03.618 DEBUG Ftp(1) TLS: HandshakeMessage:Certificate was received. 2009-26-11 19:24:03.618 DEBUG Ftp(1) TLS: HandshakeMessage:ServerHelloDone was received. 2009-26-11 19:24:03.628 DEBUG Ftp(1) TLS: Verifying server certificate ('L=PRAHA, S=-, C=CZ, CN=REBEX CA, E=support@rebex.cz, O=REBEX CR s.r.o., OU=-'). 2009-26-11 19:24:03.678 DEBUG Ftp(1) TLS: HandshakeMessage:ClientKeyExchange was sent. 2009-26-11 19:24:03.708 DEBUG Ftp(1) TLS: CipherSpec:ChangeCipherSpec was sent. 2009-26-11 19:24:03.708 DEBUG Ftp(1) TLS: HandshakeMessage:Finished was sent. 2009-26-11 19:24:03.728 DEBUG Ftp(1) TLS: CipherSpec:ChangeCipherSpec was received. 2009-26-11 19:24:03.728 DEBUG Ftp(1) TLS: HandshakeMessage:Finished was received. 2009-26-11 19:24:03.738 DEBUG Ftp(1) Info: Control connection upgraded to TLS/SSL. 2009-26-11 19:24:03.758 INFO Ftp(1) Response: 331 Password required for anonymous. 2009-26-11 19:24:03.768 INFO Ftp(1) Response: 230 User anonymous logged in. 2009-26-11 19:24:03.778 INFO Ftp(1) Response: 211 End. 2009-26-11 19:24:03.798 INFO Ftp(1) Response: 200 Noted. 2009-26-11 19:24:03.818 DEBUG Ftp(1) Info: Starting data transfer. 2009-26-11 19:24:03.838 INFO Ftp(1) Response: 200 PROT command successful. 2009-26-11 19:24:03.848 INFO Ftp(1) Response: 200 Type set to A. 2009-26-11 19:24:03.878 DEBUG Ftp(1) Info: Establishing data connection to 80.79.26.70:1028. 2009-26-11 19:24:03.898 INFO Ftp(1) Response: 150 Data connection accepted from 213.29.249.62:52977; transfer starting. 2009-26-11 19:24:03.898 DEBUG Ftp(1) Info: Upgrading data connection to TLS/SSL. 2009-26-11 19:24:03.908 DEBUG Ftp(1) TLS: Data connection: HandshakeMessage:ClientHello was sent. 2009-26-11 19:24:03.918 DEBUG Ftp(1) TLS: Data connection: HandshakeMessage:ServerHello was received. 2009-26-11 19:24:03.918 DEBUG Ftp(1) TLS: Data connection: HandshakeMessage:Certificate was received. 2009-26-11 19:24:03.918 DEBUG Ftp(1) TLS: Data connection: HandshakeMessage:ServerHelloDone was received. 2009-26-11 19:24:03.918 DEBUG Ftp(1) TLS: Data connection: Verifying server certificate ('L=PRAHA, S=-, C=CZ, CN=REBEX CA, E=support@rebex.cz, O=REBEX CR s.r.o., OU=-'). 2009-26-11 19:24:03.918 DEBUG Ftp(1) TLS: Data connection: HandshakeMessage:ClientKeyExchange was sent. 2009-26-11 19:24:03.918 DEBUG Ftp(1) TLS: Data connection: CipherSpec:ChangeCipherSpec was sent. 2009-26-11 19:24:03.918 DEBUG Ftp(1) TLS: Data connection: HandshakeMessage:Finished was sent. 2009-26-11 19:24:03.938 DEBUG Ftp(1) TLS: Data connection: CipherSpec:ChangeCipherSpec was received. 2009-26-11 19:24:03.938 DEBUG Ftp(1) TLS: Data connection: HandshakeMessage:Finished was received. 2009-26-11 19:24:03.938 DEBUG Ftp(1) Info: Data connection upgraded to TLS/SSL. 2009-26-11 19:24:03.968 INFO Ftp(1) TLS: Data connection: Alert Alert:Alert was received. 2009-26-11 19:24:03.978 INFO Ftp(1) TLS: Data connection: Alert Alert:Alert was sent. 2009-26-11 19:24:03.978 DEBUG Ftp(1) Info: Data transfer ended. 2009-26-11 19:24:03.978 DEBUG Ftp(1) Info: Closing downloading data connection. 2009-26-11 19:24:03.978 DEBUG Ftp(1) TLS: Data connection: Closing TLS socket. 2009-26-11 19:24:03.988 DEBUG Ftp(1) Info: Waiting for data transfer ending message. 2009-26-11 19:24:03.988 INFO Ftp(1) Response: 226 Transfer ok.
2009-26-11 19:24:03.988 DEBUG Ftp(1) Info: Data transfer ended. 2009-26-11 19:24:03.988 DEBUG Ftp(1) Info: Transfer ended successfully. 2009-26-11 19:24:03.988 DEBUG Ftp(1) Info: Data connection closed. 2009-26-11 19:24:03.988 DEBUG Ftp(1) Info: Starting data transfer. 2009-26-11 19:24:03.998 DEBUG Ftp(1) Info: Establishing data connection to 80.79.26.70:1028. 2009-26-11 19:24:04.018 INFO Ftp(1) Response: 150 Data connection accepted from 213.29.249.62:54308; transfer starting. 2009-26-11 19:24:04.018 DEBUG Ftp(1) Info: Upgrading data connection to TLS/SSL. 2009-26-11 19:24:04.028 DEBUG Ftp(1) TLS: Data connection: HandshakeMessage:ClientHello was sent. 2009-26-11 19:24:04.038 DEBUG Ftp(1) TLS: Data connection: HandshakeMessage:ServerHello was received. 2009-26-11 19:24:04.038 DEBUG Ftp(1) TLS: Data connection: CipherSpec:ChangeCipherSpec was received. 2009-26-11 19:24:04.038 DEBUG Ftp(1) TLS: Data connection: HandshakeMessage:Finished was received. 2009-26-11 19:24:04.038 DEBUG Ftp(1) TLS: Data connection: CipherSpec:ChangeCipherSpec was sent. 2009-26-11 19:24:04.038 DEBUG Ftp(1) TLS: Data connection: HandshakeMessage:Finished was sent. 2009-26-11 19:24:04.038 DEBUG Ftp(1) Info: Data connection upgraded to TLS/SSL. 2009-26-11 19:24:04.168 INFO Ftp(1) TLS: Data connection: Alert Alert:Alert was received. 2009-26-11 19:24:04.168 INFO Ftp(1) TLS: Data connection: Alert Alert:Alert was sent. 2009-26-11 19:24:04.178 DEBUG Ftp(1) Info: Data transfer ended. 2009-26-11 19:24:04.178 DEBUG Ftp(1) Info: Closing downloading data connection. 2009-26-11 19:24:04.178 DEBUG Ftp(1) TLS: Data connection: Closing TLS socket. 2009-26-11 19:24:04.178 DEBUG Ftp(1) Info: Waiting for data transfer ending message. 2009-26-11 19:24:04.178 INFO Ftp(1) Response: 226 Transfer ok.
2009-26-11 19:24:04.188 DEBUG Ftp(1) Info: Data transfer ended. 2009-26-11 19:24:04.188 DEBUG Ftp(1) Info: Transfer ended successfully. 2009-26-11 19:24:04.188 DEBUG Ftp(1) Info: Data connection closed. 2009-26-11 19:24:19.864 File opened for writting log. [2009-26-11 19:24:19.894] INFO - FtpClient(1) Info: Connecting to ftp.rebex.net:21 [NetXtremeFtp v3.0.0.0 (Evaluation Version)]. [2009-26-11 19:24:19.894] INFO - FtpClient(1) Info: Proxy: NONE. [2009-26-11 19:24:19.964] DEBUG - FtpClient(1) Info: Connection established. [2009-26-11 19:24:19.994] INFO - FtpClient(1) Response: 234 AUTH command ok; starting SSL connection. [2009-26-11 19:24:19.994] DEBUG - FtpClient(1) Info: Upgrading control connection to TLS/SSL. [2009-26-11 19:24:20.024] DEBUG - FtpClient(1) TLS: HandshakeMessage: ClientHelloHandshake was sent. [2009-26-11 19:24:20.064] DEBUG - FtpClient(1) TLS: HandshakeMessage: ServerHelloHandshake was received. [2009-26-11 19:24:20.074] DEBUG - FtpClient(1) TLS: HandshakeMessage: CertificateHandshake was received. [2009-26-11 19:24:20.074] DEBUG - FtpClient(1) TLS: HandshakeMessage: ServerHelloDoneHandshake was received. [2009-26-11 19:24:20.094] DEBUG - FtpClient(1) TLS: Verifying server certificate ('L=PRAHA, S=-, C=CZ, CN=REBEX CA, E=support@rebex.cz, O=REBEX CR s.r.o., OU=-'). [2009-26-11 19:24:20.144] DEBUG - FtpClient(1) TLS: HandshakeMessage: ClientKeyExchangeHandshake was sent. [2009-26-11 19:24:20.174] DEBUG - FtpClient(1) TLS: CipherSpec: ChangeCipherSpec was sent. [2009-26-11 19:24:20.174] DEBUG - FtpClient(1) TLS: HandshakeMessage: FinishedHandshake was sent. [2009-26-11 19:24:20.194] DEBUG - FtpClient(1) TLS: CipherSpec: ChangeCipherSpec was received. [2009-26-11 19:24:20.194] DEBUG - FtpClient(1) TLS: HandshakeMessage: FinishedHandshake was received. [2009-26-11 19:24:20.204] DEBUG - FtpClient(1) Info: Control connection upgraded to TLS/SSL. [2009-26-11 19:24:20.224] INFO - FtpClient(1) Response: 331 Password required for anonymous. [2009-26-11 19:24:20.234] INFO - FtpClient(1) Response: 230 User anonymous logged in. [2009-26-11 19:24:20.244] INFO - FtpClient(1) Response: 211 End. [2009-26-11 19:24:20.264] INFO - FtpClient(1) Response: 200 Noted. [2009-26-11 19:24:20.334] INFO - FtpClient(1) Response: 200 PROT command successful. [2009-26-11 19:24:20.344] INFO - FtpClient(1) Response: 200 Type set to A. [2009-26-11 19:24:20.364] DEBUG - FtpClient(1) Info: Establishing data connection. [2009-26-11 19:24:20.394] INFO - FtpClient(1) Response: 150 Data connection accepted from 213.29.249.62:53105; transfer starting. [2009-26-11 19:24:20.394] DEBUG - FtpClient(1) Info: Upgrading data connection to TLS/SSL. [2009-26-11 19:24:20.404] DEBUG - FtpClient(1) TLS: Data connection: HandshakeMessage: ClientHelloHandshake was sent. [2009-26-11 19:24:20.414] DEBUG - FtpClient(1) TLS: Data connection: HandshakeMessage: ServerHelloHandshake was received. [2009-26-11 19:24:20.414] DEBUG - FtpClient(1) TLS: Data connection: HandshakeMessage: CertificateHandshake was received. [2009-26-11 19:24:20.414] DEBUG - FtpClient(1) TLS: Data connection: HandshakeMessage: ServerHelloDoneHandshake was received. [2009-26-11 19:24:20.414] DEBUG - FtpClient(1) TLS: Data connection: Verifying server certificate ('L=PRAHA, S=-, C=CZ, CN=REBEX CA, E=support@rebex.cz, O=REBEX CR s.r.o., OU=-'). [2009-26-11 19:24:20.414] DEBUG - FtpClient(1) TLS: Data connection: HandshakeMessage: ClientKeyExchangeHandshake was sent. [2009-26-11 19:24:20.414] DEBUG - FtpClient(1) TLS: Data connection: CipherSpec: ChangeCipherSpec was sent. [2009-26-11 19:24:20.414] DEBUG - FtpClient(1) TLS: Data connection: HandshakeMessage: FinishedHandshake was sent. [2009-26-11 19:24:20.434] DEBUG - FtpClient(1) TLS: Data connection: CipherSpec: ChangeCipherSpec was received. [2009-26-11 19:24:20.434] DEBUG - FtpClient(1) TLS: Data connection: HandshakeMessage: FinishedHandshake was received. [2009-26-11 19:24:20.434] DEBUG - FtpClient(1) Info: Data connection upgraded to TLS/SSL. [2009-26-11 19:24:20.454] INFO - FtpClient(1) TLS: Data connection: Alert Alert: AlertHandshake was received. [2009-26-11 19:24:20.464] INFO - FtpClient(1) TLS: Data connection: Alert Alert: AlertHandshake was sent. [2009-26-11 19:24:20.464] DEBUG - FtpClient(1) Info: Data transfer ended. [2009-26-11 19:24:20.464] DEBUG - FtpClient(1) Info: Closing downloading data connection. [2009-26-11 19:24:20.464] DEBUG - FtpClient(1) TLS: Data connection: Closing secure socket. [2009-26-11 19:24:20.474] DEBUG - FtpClient(1) Info: Waiting for data transfer ending response. [2009-26-11 19:24:20.474] INFO - FtpClient(1) Response: 226 Transfer ok.
[2009-26-11 19:24:20.474] DEBUG - FtpClient(1) Info: Transfer ended. [2009-26-11 19:24:20.474] DEBUG - FtpClient(1) Info: Transfer ended successfully. [2009-26-11 19:24:20.474] DEBUG - FtpClient(1) Info: Data connection closed. [2009-26-11 19:24:20.484] DEBUG - FtpClient(1) Info: Establishing data connection. [2009-26-11 19:24:20.504] INFO - FtpClient(1) Response: 150 Data connection accepted from 213.29.249.62:58123; transfer starting. [2009-26-11 19:24:20.504] DEBUG - FtpClient(1) Info: Upgrading data connection to TLS/SSL. [2009-26-11 19:24:20.514] DEBUG - FtpClient(1) TLS: Data connection: HandshakeMessage: ClientHelloHandshake was sent. [2009-26-11 19:24:20.524] DEBUG - FtpClient(1) TLS: Data connection: HandshakeMessage: ServerHelloHandshake was received. [2009-26-11 19:24:20.524] DEBUG - FtpClient(1) TLS: Data connection: CipherSpec: ChangeCipherSpec was received. [2009-26-11 19:24:20.524] DEBUG - FtpClient(1) TLS: Data connection: HandshakeMessage: FinishedHandshake was received. [2009-26-11 19:24:20.524] DEBUG - FtpClient(1) TLS: Data connection: CipherSpec: ChangeCipherSpec was sent. [2009-26-11 19:24:20.524] DEBUG - FtpClient(1) TLS: Data connection: HandshakeMessage: FinishedHandshake was sent. [2009-26-11 19:24:20.524] DEBUG - FtpClient(1) Info: Data connection upgraded to TLS/SSL. [2009-26-11 19:24:20.664] INFO - FtpClient(1) TLS: Data connection: Alert Alert: AlertHandshake was received. [2009-26-11 19:24:20.664] INFO - FtpClient(1) TLS: Data connection: Alert Alert: AlertHandshake was sent. [2009-26-11 19:24:20.664] DEBUG - FtpClient(1) Info: Data transfer ended. [2009-26-11 19:24:20.664] DEBUG - FtpClient(1) Info: Closing downloading data connection. [2009-26-11 19:24:20.664] DEBUG - FtpClient(1) TLS: Data connection: Closing secure socket. [2009-26-11 19:24:20.664] DEBUG - FtpClient(1) Info: Waiting for data transfer ending response. [2009-26-11 19:24:20.674] INFO - FtpClient(1) Response: 226 Transfer ok.
[2009-26-11 19:24:20.674] DEBUG - FtpClient(1) Info: Transfer ended. [2009-26-11 19:24:20.674] DEBUG - FtpClient(1) Info: Transfer ended successfully. [2009-26-11 19:24:20.674] DEBUG - FtpClient(1) Info: Data connection closed. Oldest known external reference: 'SomeNewKid' (a forums.asp.net veteran with more that 45000 post points) recommended Rebex FTP component in July 2003. [link] [screenshot]. Rebex: was founded in 1995. The Internet Archive (web.archive.org) houses archived versions of rebex.cz from 1997-today (software consulting) and archived versions of rebex.net from 2002-today (.NET components). Both websites are still active today. We have always been located in Prague, Czech Republic. ComponentForge: The Internet Archive (web.archive.org) doesn't have any (archived versions of safabyte.com). They have some (archived versions of componentforge.com), but it was only active in 2004 and 2005 and used to be a website of an unrelated company. Their current domain was only registered in July 2009. And what's more - this 'ComponentForge, LLC' most likely doesn't even exist - the Nebraska (where they claim to have HQ) Corporation and Business Entity Search doesn't have any records for them. They were almost certainly operating from Vietnam, where their previous incarnation called Safabyte (safabyte.com) was located. ComponentForge, SafaByte, XtraComponents, another name, anyone? The "vendor" of NetXtreme components managed to change their company name 2 times a year. It used to be called Safabyte (safabyte.com) and ComponentForge (componentforge.net) in 2009 and it looks like they used the xtremeui.com domain in the past (it still redirects to their current website as of November 2009). Looks like trying to hide? No doubt about it. Rebex: no name change ever. Rebex is not the only vendor whose code was misused by the scammers. Some of "Safabyte/ComponentForge" components in fact infringe on intellectial property owned by ComponentAce, ComponentSpace and LanapSoft. We have much more evidence. Posting it on this website could invalidate lot of it because ComponentForge can quickly change their website, documentation, API or the copy of our code. Please contact us if you are interested in more information.